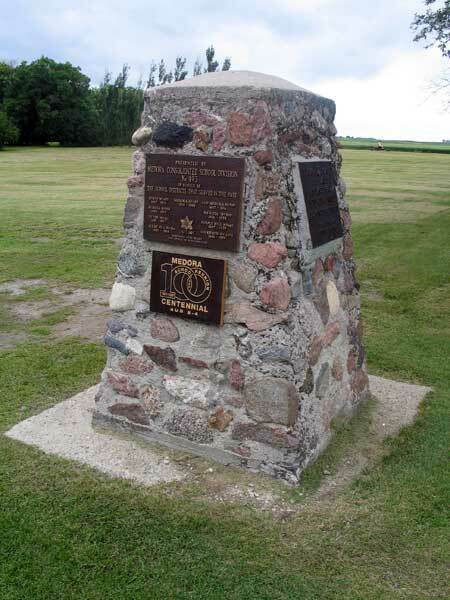 Plaques on a monument in Medora, in what is now the Municipality of Brenda-Waskada, commemorate the Canadian centennial year (1967), the Manitoba centennial year (1970), and a reunion for the Medora School (August 1991). Erected at a ceremony on 30 June 1967, it acknowledges the rural schools that were merged into Medora Consolidated School No. 493: Otter School No. 411, Purple Hill School No. 487 (1887-1959), Old Medora School No. 493 (1887-1914), Medora School No. 493 (1914-1959), Mimosa School No. 532, Menota School No. 519, Berry Hill School No. 748, and Sherwood School No. 1478 (1902-1959). Known originally as Burns School when it opened in 1887, on the northeast quarter of 24-3-25W, the building was moved into Medora in 1898 and replaced by another structure in 1906. Its name changed to Medora about 1914. 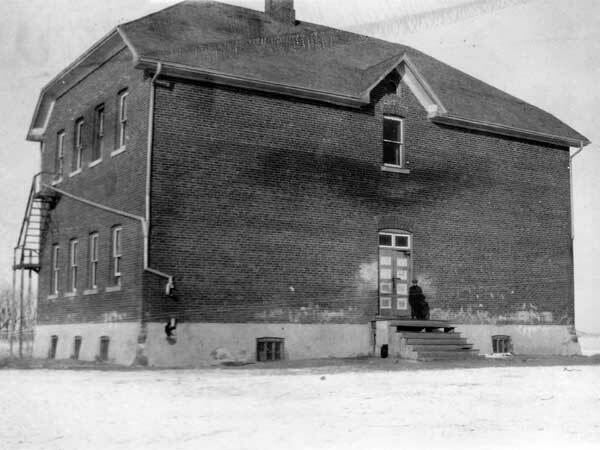 A four-room brick school was erected in 1928, only two rooms of which were needed at the time. A third classroom opened in 1953 and the fourth in 1958 with the consolidation of the school with nearby rural schools. A new, four-room school with auditorium was built between 1959 and 1960, handling students from grades 1 to 10. Gradually, over time, enrollment dwindled as grade levels were moved to Deloraine, starting in 1965 with grades 9 and 10. Five years later, students in grades 7 and 8 moved out. By 1975, with only three teachers left, the school was closed permanently and the remaining students went either to Deloraine or Melita. The building was then sold to the Medora Community Club. 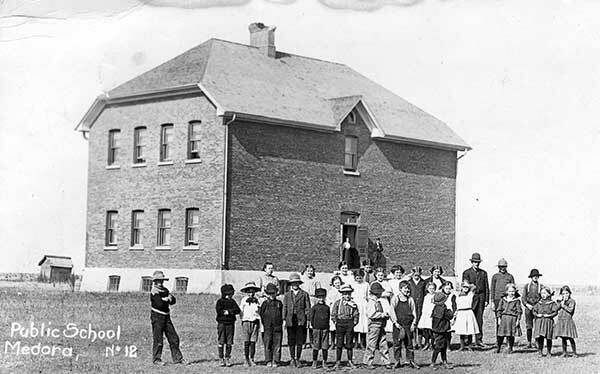 Among the teachers of Medora School up to 1917 were Henry Thompson (1888), Alfred A. Downey (1892-1893), L. Perrin (1893), M. E. Hawthorne (1894), Nellie Sutherland (1894), Alberta Logan (1899-1900), M. Frances Logan (1900-1901), Mary K. Cox (1905-1906), Mary E. Bidkin (1905), Elizabeth M. Borthwich (1906-1907), Mabel C. Tait (1907), Bessie E. Durling (1907), D. A. McKenzie (1908), Isabelle S. Fargey (1908), Kate S. Fullerton (1908-1909), J. Jean Clandening (1909), Arthur S. Robinson (1909-1910), Mary S. Clay (1909), Mildred Brain (1910), Ellen A. Finch (1910-1911), Theresa Switzer (1910-1911), Florence Perrin (1910), Belle Perrin (1911), Irene Johnston (1911), Laura M. Groves (1911), W. J. Gordon Scott (1912-1913), C. R. De Witt (1912), Annie M. Scott (1913-1914), Maggie L. Scott (1913-1914), Robert G. Sinnamon (1915-1917), E. M. Ayers (1915-1916), Gertrude K. Harvey (1916), and Laurine F. White (1917). GR8461, A0233, C131-1, page 72. Bridging Brenda: The History of Brenda Municipality and Area, Volume 1 by Brenda History Committee, 1990, pages 101-103.